I am pleased to announce that I have finally updated my teaching website, so the calendar is current as of now, but I'm working on some additional bookings, so it will need a refresh soon. You may notice my new smokin' brown hair in the photos above. Needed a change. Lovin' the change! But enough about my hair - let's talk about this Home Construction program. I've been mulling over how to offer online classes for some time now. My projects are technique-based, meaning the "wow" factor is in the interactive features, not necessarily the specific products used. It is desperately simple to re-do my classes in different color schemes and themes. My dear friends in Europe have definitely figured this out - they often purchase just the instructions for a class, fully intending to ignore the supply list and use their own materials rather than paying shipping and customs for a kit from the States. Kitting is not my favorite activity. There, I said it. I would much rather be designing new projects than ordering, cutting, separating, kitting and storing materials for classes. Oh sure, I can't escape that chore entirely, because I do my own kits for the classes that I teach, but I *can* eliminate the chore (and upfront expense) for online classes. For these projects I'm passing the torch to you, dear home constructors, to assemble your own kit. However, I'm going to make it easy for you. I'm starting every Home Construction project from a product kit from a major manufacturer. 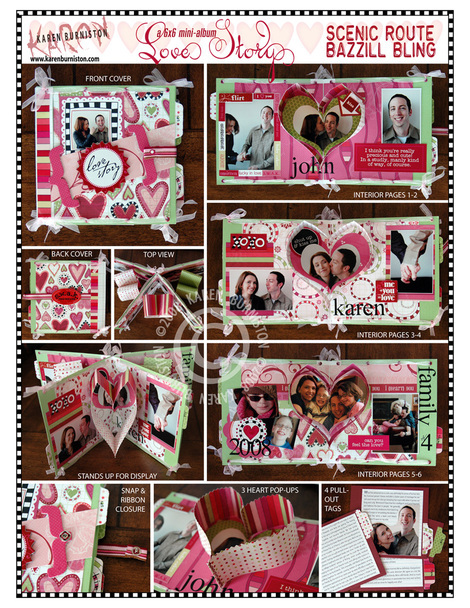 For Love Story, I started with the Loveland Product Kit from Scenic Route. So here's what you do - you order the instructions from my website using the "PayPal Buy Now" button that I've finally figured out how to include. Next, you get the instructions via e-mail, print them out, and check your stash for the other supplies (you probably have them!) and then you head on over to your local store, buy the Loveland kit or demand that they order it, and get busy on your project. 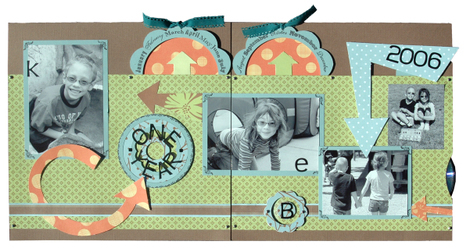 Pssst - Colorado ladies - Scrapbook Destination has the Loveland Kits. Or maybe you branch out on your own with a completely different set of papers and embellishments - I won't stop you! You do as you please. The only thing I request is that you not share the instructions with your friends - please have them buy their own. I priced them at $12, which really isn't that much when you see the work involved - 9 pages of detailed instructions, cut diagrams, templates, photos - I've been working on this one project for three weeks! I drafted seven new templates for it. If you've taken a class from me, you know that my handouts are pretty darn detailed. These handouts are even MORE detailed - I'm approaching these projects knowing that people must be able to make them from the handout alone - no original to look at - no Karen to explain it. (Although, you can always e-mail me and I'll walk you through anything tricky - I'm not heartless!) Honestly, I feel pretty confident about your success. You're brilliant, after all! That's my sales pitch for the new program. I'd love some feedback. Is this a decent alternative for the folks that would love to tackle my interactive hooliganism (love that!) but live nowhere near me? Any suggestions? Why do they even HAVE that color? YZMA: Pull the lever, Kronk! YZMA: Why do we even HAVE that lever?! ORTHO: Pick a color, Karl! ME: WRONG COLOR! Why do they even HAVE that color? Karl is partially color blind. He has a hard time with greens and oranges, and occasionally reds and browns. From the time he was old enough to name his colors he has had an unwavering favorite - the one color that always looks right to him - yellow. Karl's favorite color is yellow. Karl was allowed, with no input from Mom in the waiting room, to pick the color of his brackets. For most people, purposely making your teeth yellow might seem, well, unheard of. Karl, however, has been rather glum about this whole braces thing, unable to fathom why he should care about straight teeth (or his appearance in general), and therefore qualmless about picking his favorite color for the brackets. How they would look would never occur to him. I'm used to it now. At first my heart sunk, but not nearly as much as his when he looked over the list of foods he would no longer be able to eat. His face fell at the hard/chewy candy, and then even further on the "chips that end in 'o's, Fritos, Cheetos, Doritos", but it was the final item that set his bottom lip to quivering and the tears welling up in his eyes. He can't have popcorn. This kid LOVES popcorn! I felt so bad for him that we went straight to Burger King for a milkshake before heading to school. 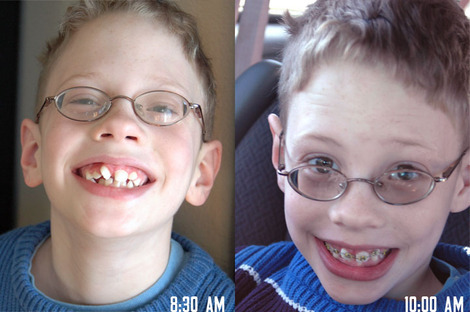 They're going to work on the top first and then add the bottom braces later. If ever there were an orthodontic challenge it's Karl - I don't think any of his teeth are straight! Hopefully there's a movie star smile in his future! There's a long new post of silly adventures right below this one, so scroll on by this work post if you're only here to laugh at me. My website needs updating and a bunch of e-mails need answering, so please be patient with me. My business has one employee, and her hat collection is overflowing at the moment. And actually, the papers are double-sided, so you can flip the green to the striped side if you prefer, and the orange tags can be brown flowered, or something like that. The CD spins, the arrow comes up, the journaling is revealed, etc., etc. It's just like the project on my website in functionality. In other news, I will be at CHA for two days - Sunday and Monday, so if you're going, I'd love to see you. New class designs are in the works! A month off, a clean office, the kids back in school . . . three perfect ingredients for itchy fingers! Stay tuned! It snows here. We're used to it. Sometimes it cancels school, sometimes it delays school, and sometimes we just trudge through it to school. We live in a large school district that includes some higher elevation areas that often dictate the decision. What seems traversable in our neighborhood may not matter if there's a foot of snow on the roads up north. Although the district updates their website with any closures, most everyone just turns on the TV. The major channels will run a ticker at the bottom of the screen announcing any closures or delays. Monday's snow made it questionable for school on Tuesday. We had 3" and snowy roads at bedtime and more expected overnight. I had been fighting a bug for a week and a lack of food gave me a heck of a headache. Although it was midnight and I didn't have an 8-hour sleep window, I decided to bank on a snow delay and take a "sleep" pain reliever instead of just a pain reliever. I needed a good night's rest, after all. When John got up around 6:45 and turned on the TV, it barely registered in my still-drugged sleep stupor. When he announced "There's no school." I was asleep again within a minute. I kind of heard the children getting up a little while later and John telling them it was a snow day, some whoops of delight, and then I was out again. The phone woke me up at 7:45. BD: Hi! It's Karl's bus driver. We're outside - is he coming to school today? ME: (shaking cobwebs from head) Huh? But . . . but . .. my husband said it was a snow day. BD: Well if it's a snow day we didn't get the message. Are you sending him out? ME: He's not ready. I'm sorry. I'll have to drive him. I stumbled out the door and to the landing where I observed two delighted pajama-clad children playing a rousing game on the Wii while their fully-dressed and coffee-sipping father looked on - the picture of snow day tranquility. ME: JOHN?!! What the . . . ? Karl's bus is OUTSIDE! JOHN: (with puzzled conviction) No. That can't be right. It said on the TV "District 20 - no report"
ME: OK? And? That means that the district didn't send in a cancellation report. JOHN: Oh. I thought it meant they didn't have to report to school. Men. It's like their skulls are full of marshmallows, no? Did he actually believe that a school district would use the phrase "No report" as a directive? How does that even make grammatical sense? "You. Kids. No. Report. School. Kemosabe." I didn't have time to see the humor in it because I had to rush around getting the kids ready. It was possible to get Emma to school on time but there was no chance of Karl making it. He goes to school up north where the roads are treacherous and the drive time, on a clear day, is at least 20 minutes. While I was whining about having to drive Karl and the kids were really whining about having to go to school, John was whining that everyone was mad at him. He meekly offered to take Karl to school in his 4WD truck. He called his office to say that he had falsely reported a snow day and would be late. I didn't argue since Bonnie and Ev were coming to my house at 10 for a shopping/lunch girlstravaganza. I dropped off Emma a few minutes late but not late enough to require me to exit the van in my pajamas and slippers to sign her in. Whew. I flew back home and shoveled a path for the girls and then went inside to call Evelyn with the crazy story. EV: (when she was done laughing) OK, I'm going to lift some weights, jump in the shower and then I'll be over. ME: I need to shower, too, but I also need to get the dishwasher unloaded and loaded. What time is it? EV: It's only 8:55, so you have time. ME: OK, see you soon. Now, those pricing gimmicks where things are priced at Blank.99 to make you think they're cheaper never fool me. I just round up to the next whole dollar. Time, however, is apparently a mathematical mystery. Because when Ev said it was 8:55, I registered that as "8" which meant I had two whole hours to get ready. So I poured myself a cup of coffee and read the paper. Casually glancing at the clock as the steam from my coffee mug swathed my glasses in a french vanilla fog, and ignoring for a second the Living section that beckoned me to read on, I somehow managed to register the time as 9:25 and accurately assess that I had 35 minutes to transform myself and my kitchen into something more presentable. I ran up the stairs, flinging slippers and peeling off pajamas as I went. Murphy was in fine legal form as I managed to bring my hand down on the edge of my contacts case, right after I had loosened both sides, sending the case and both contacts flying to the floor. I found one of the contacts, but had no idea which eye it belonged to. I had to break out my final pair, meaning an eye appointment got added to my mental list, right after "Convert mental list to a written list"
So other than being sick, I also managed to finally get my office/craft room cleaned up. Mom had canceled on me before Christmas because of a snowstorm, but came down last week with her whip and bird dog tenacity. She wouldn't let me quit, and two long days of work produced 10 trash bags, 5 boxes of give-aways, and a sparkling clean workspace that sat unused for days while I moaned in pestilence. Murphy, I salute you! And then last night I had to do cookie training with Emma's troop. I'm back for another grueling stint as cookie mom. We start selling on Friday. In final news, Emma's class had a book published. 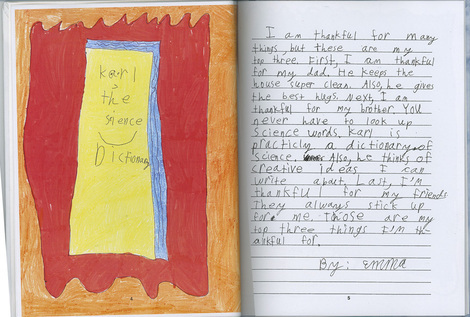 They each contributed a drawing and accompanying essay on three things they were thankful for. The content remained private until the book arrived, so as to surprise the parents with a touching memento of 4th grade perspective. I think the word you're looking for is "Ouch!" Yes, I did not make the cut on my child's "things I'm thankful for" list. When I asked her about it, probably using the words "chopped liver" in the question, she just laughed and said that she couldn't list everything she was thankful for, just three things. As she skipped off I called after her "But you said these were your 'top' three. The word 'top' was used. Twice." I showed it to John that evening and he was delighted with her nice transitions and excellent use of the word "practically". ME: Well I'm a little hurt. What do you suppose it means that she didn't list me? JOHN: I don't think it means anything. I wouldn't worry about it. ME: You're only saying that because YOU made the list! JOHN: (laughing, bowing and making gestures of waving off applause) No, no. Hey - did you read all the other essays? ME: (sulking) No. I was in shock. JOHN: Well let's just see what the other kids are thankful for. He read each one out loud and I must admit that it made me feel a little better. Another girl had a similar maternal omission and while a few kids were thankful for their "parents", the vast majority were thankful for their skateboards, animals and big screen TV's. Still, it was kind of nagging at me. I brought it up again on the way home from Girl Scouts last night. ME: So, Emma, I'm really curious why I wasn't mentioned in your Thankful essay. Did you just forget about me or are you really not thankful for me? EMMA: No, I'm thankful for you, but I didn't want to use only family members and after I wrote the part about Dad, I couldn't think of different things to say about you. And it was supposed to be different. ME: (relieved) OH! So you're saying that you would have wanted to write that I keep the house super clean and that I give good hugs, but you couldn't, right? EMMA: Well . . . you DO clean the house, but I think Dad cleans it better because you had that messy office for so long. ME: Well it's all cleaned up now, so we're even! EMMA: No, because Mimi had to help you!